Quasars are active black holes – primarily from the early universe. Using a special method where you observe light that has been bent by gravity on its way through the universe, a group of physics students from the Niels Bohr Institute have observed a quasar whose light has been deflected and reflected in six separate images. This is the first time a quasar has been observed with so many light reflections. The results are published in the scientific journal, Astrophysical Journal. 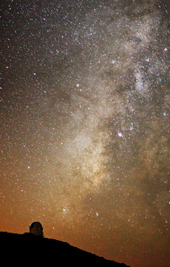 A group of 3rd year astrophysics students at the Niels Bohr Institute went on a weeklong course to make observations at the Nordic Optical Telescope, NOT, on La Palma in Spain. Four of the students wanted to do a project together and they discovered a new and exciting observation that the Norwegian astronomer Håkon Dahle had recorded, but had not yet made a further study of. “Just like ‘ordinary’ researchers, they then had to make an application for observation time at the Nordic Optical Telescope,” explains DARK Professor Johan Fynbo, who was their supervisor at the summer course. The students were granted observation time and already the first night there was exciting news in the telescope. Due to the special gravitational lens effect where light is bent as it passes heavy objects, such as galaxy clusters, a group of physics students at the Niels Bohr Institute observed a quasar whose light was reproduced six times. This has never been seen before. “We had three hours to observe and already after one hour we had the first spectrum. It was a new experience for us, but we could see immediately that it was a quasar. A typical characteristic of a quasar is that the light has broad emission lines from gas close to the black hole. We were very excited and moved on to the other ‘candidates’ from observation and later that night we found yet another light reflection of the quasar,” explains Thejs Brinckmann, one of the astrophysics students working on the project. The other students in the group were Mikkel Kristensen, Mikkel Lindholmer and Anders Nielsen. The light they observed came from a quasar, which is an active, super massive black hole at the centre of a distant galaxy. 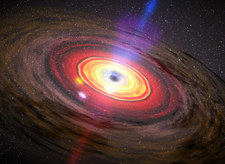 Such active, super massive black holes swallow gas from its surroundings. Due to the tremendous gravitational pull, the gases are pulled from the surrounding region into the black hole with incredible speed and gases near the black hole are heated to millions of degrees. This extremely hot gas emits radiation, which then heats the enormous dense clouds of dust and gas that circulate at a slightly greater distance from the black hole. The heat causes the gas to light up with incredibly powerful emission of light – stronger than the light from many galaxies. Quasars are thus extremely luminous and can be observed across the entire universe. But light does not always move in a straight line. Light is affected by the gravity of objects it encounters in its path. “The light from this quasar has been travelling for more than 11 billion years en route to Earth. Between the quasar and Earth is a collection of hundreds of galaxies – a galaxy cluster. This galaxy cluster has so much gravity that it pulls the light from the quasar. So instead of radiating in straight lines from the quasar, the light is deflected in an arc around the galaxy cluster. In this way, one can observe not just one, but several images of the same quasar. This is called the gravitational lens effect,” explains Johan Fynbo. During the allotted observation time over three nights, the four students took spectra of four different images that could stem from the same quasar. “We analysed the spectra and we could see that three of the spectra stemmed from the quasar,” explains Thejs Brinckmann. When the Norwegian astronomer Håkon Dahle, who had originally discovered the sources of the quasar, heard about the students’ observations, he thought they were so exciting that he decided to study the field further. When he went to NOT a month later, he observed three other so-called ‘candidates’ for the quasar and they all proved to be from the same quasar. “This is the first time that a quasar has observed whose light has been reflected or ‘lensed’ in six separate image,” explains Johan Fynbo. ‘Lensed’ quasars are rare and you typically see two or three light-reflections. 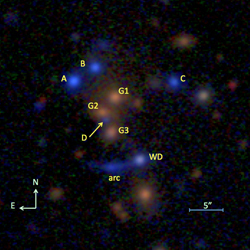 Six images of the same quasar have never been observed before. 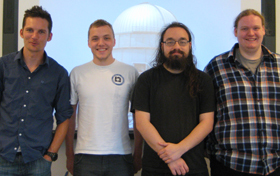 The four physics students Anders Nielsen, Mikkel Kristensen, Mikkel Lindholmer and Thejs Brinckmann worked together on a project at the Nordic Telescope on La Palma in Spain and they observed a quasar that was imaged six times. This has never been seen before. In addition to the quasar itself, you also get other interesting information. A quasar varies in brightness and you can measure that there is a different arrival time for the light from the different observations, because the light paths are not of equal length. In this way you can calculate the geometric model of the light’s path. You can also calculate the mass of the galaxy cluster and you can calculate what is called the Hubble parameter, which tells us about the expansion of the universe. "It is amazing to be allowed to participate in something that is relevant to research so early in our education. It has been an incredible experience for the students, whose appetite for a future as a researcher has been whetted even more. Gravitational lensing describes the way in which a concentration of mass can function as a normal optical lens, i.e. it will deflect the light from the underlying light source. Gravitational lensing is primarily useful in astrophysics for two reasons: first, the effect allows for a determination of the total mass of the object that is causing the deflection. Second, the lensing can cause the total luminosity, which we measure on Earth to be many times greater than it would have been without the lensing, so we can study much weaker objects than would otherwise be possible.